Herpes Simplex Virus (HSV) is a common disease that belongs to the Herpesviridae family and primarily affects the skin and mucous membranes. Initial infection with HSV has been shown to occur via entry to human keratinocytes utilizing the nectin-1 receptor [1Sayers CL, Elliott G. Herpes Simplex Virus 1 enters human keratinocytes by a nectin-1-dependent, rapid plasma membrane fusion pathway that functions at low temperature. J Virol 2016; 90(22): 10379-89. [http://dx.doi.org/10.1128/JVI.01582-16] [PMID: 27630229] ]. After the primary HSV infection, the virus enters an extended dormant phase within the dorsal root ganglia, during which the patient does not show signs or symptoms of the disease [2Miura S, Smith CC, Burnett JW, Aurelian L. Detection of viral DNA within skin of healed recurrent herpes simplex infection and erythema multiforme lesions. J Invest Dermatol 1992; 98(1): 68-72. [http://dx.doi.org/10.1111/1523-1747.ep12495372] [PMID: 1309462] ]. Current dogma states that recurrent clinical symptoms of herpes simplex virus are the result of the activation of latent viral genome within the dorsal root ganglia. The virus is stimulated to induce replication and subsequent anterograde transport of the virus along the peripheral sensory nerve to the cutaneous or mucosal surface. This, in turn, results in the production of vesicles on skin and mucosal surfaces [2Miura S, Smith CC, Burnett JW, Aurelian L. Detection of viral DNA within skin of healed recurrent herpes simplex infection and erythema multiforme lesions. J Invest Dermatol 1992; 98(1): 68-72. [http://dx.doi.org/10.1111/1523-1747.ep12495372] [PMID: 1309462] ]. The reactivation of the herpes labialis virus, a type of infection caused by HSV most commonly seen on lips, has been shown to have a bimodal temporal distribution by researchers [3Spruance SL, Freeman DJ, Stewart JC, et al. The natural history of ultraviolet radiation-induced herpes simplex labialis and response to therapy with peroral and topical formulations of acyclovir. J Infect Dis 1991; 163(4): 728-34. [http://dx.doi.org/10.1093/infdis/163.4.728] [PMID: 1849159] , 4Spruance SL, Kriesel JD, Evans TG, McKeough MB. Susceptibility to herpes labialis following multiple experimental exposures to ultraviolet radiation. Antiviral Res 1995; 28(1): 57-67. [http://dx.doi.org/10.1016/0166-3542(95)00038-N] [PMID: 8585760] ]. In one study, subjects with sun-induced herpes labialis were exposed to ultraviole radiation (UVR) on three different occasions over 3-to-4 month intervals. Of 33 total UVR induced lesions, 21% were “immediate” lesions, meaning they developed within 48 hours of exposure to UVR. The other 79% of lesions were “delayed” lesions, meaning they developed 3-7 days after UVR exposure [4Spruance SL, Kriesel JD, Evans TG, McKeough MB. Susceptibility to herpes labialis following multiple experimental exposures to ultraviolet radiation. Antiviral Res 1995; 28(1): 57-67. [http://dx.doi.org/10.1016/0166-3542(95)00038-N] [PMID: 8585760] ]. In a second study, 98 placebo subjects were exposed to UVR and consequently, 39 subjects (40%) developed delayed lesions and 11 subjects (26%) developed immediate lesions [3Spruance SL, Freeman DJ, Stewart JC, et al. The natural history of ultraviolet radiation-induced herpes simplex labialis and response to therapy with peroral and topical formulations of acyclovir. J Infect Dis 1991; 163(4): 728-34. [http://dx.doi.org/10.1093/infdis/163.4.728] [PMID: 1849159] ]. It is also noted that in these studies, the immediate lesions did not have any preceding symptoms, whereas the delayed lesions were prefaced by pain and altered sensation before the vesicles appeared. This discrepancy in lesion appearance time and associated symptoms indicates that different processes cause the immediate and delayed nature of the lesions. Natural pathogenesis of herpes labialis reaction shows that it takes 3 to 5 days to be transported from the dorsal root ganglia to the epithelial surfaces, which accounts for the delayed reaction lesions [5Maratou E, Theophilidis G, Arsenakis M. Axonal transport of herpes simplex virus-1 in an in vitro model based on the isolated sciatic nerve of the frog Rana ridibunda. J Neurosci Methods 1998; 79(1): 75-8. [http://dx.doi.org/10.1016/S0165-0270(97)00166-0] [PMID: 9531462] ]. One current hypothesis states that the immediate lesions can be accounted for by the fact that herpes simplex virus DNA can be isolated from the skin of fully healed recurrent lesions by Polymerase Chain Reaction (PCR) [2Miura S, Smith CC, Burnett JW, Aurelian L. Detection of viral DNA within skin of healed recurrent herpes simplex infection and erythema multiforme lesions. J Invest Dermatol 1992; 98(1): 68-72. [http://dx.doi.org/10.1111/1523-1747.ep12495372] [PMID: 1309462] ]. HSV has also been shown to have the ability to remain locally dormant in a 3-dimensional raft culture within human keratinocytes, as well as within the parenchyma and stratified squamous epithelium of various other organs. The ‘skin trigger’ hypothesis [6Hill TJ, Blyth WA. An alternative theory of herpes-simplex recurrence and a possible role for prostaglandins. Lancet 1976; 1(7956): 397-9. [http://dx.doi.org/10.1016/S0140-6736(76)90220-8] [PMID: 55654] ] states that HSV periodically sheds into the epithelium, and thus a change in the resistance of the epithelium (for example, exposure to UVR) is what allows lesions to develop. Prophylactic treatment using oral antiviral agents has proven to be successful in treating delayed lesions [3Spruance SL, Freeman DJ, Stewart JC, et al. The natural history of ultraviolet radiation-induced herpes simplex labialis and response to therapy with peroral and topical formulations of acyclovir. J Infect Dis 1991; 163(4): 728-34. [http://dx.doi.org/10.1093/infdis/163.4.728] [PMID: 1849159] , 4Spruance SL, Kriesel JD, Evans TG, McKeough MB. Susceptibility to herpes labialis following multiple experimental exposures to ultraviolet radiation. Antiviral Res 1995; 28(1): 57-67. [http://dx.doi.org/10.1016/0166-3542(95)00038-N] [PMID: 8585760] ]. It has been shown that prophylactic oral acyclovir prevented the development of delayed lesions when administered either 5 minutes after UVR exposure or 7 days before exposure. However, the same prophylactic treatment had no effect on the prevention of immediate lesions. One study attempted to treat subjects exposed to UVR with topical 5% acyclovir (ACV) cream beginning immediately after exposure, which showed no reduction in the frequency of delayed or immediate lesions [3Spruance SL, Freeman DJ, Stewart JC, et al. 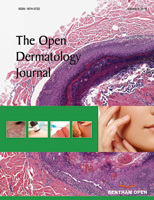 The natural history of ultraviolet radiation-induced herpes simplex labialis and response to therapy with peroral and topical formulations of acyclovir. J Infect Dis 1991; 163(4): 728-34. [http://dx.doi.org/10.1093/infdis/163.4.728] [PMID: 1849159] ]. Herpes Simplex Virus (HSV) is a common disease that is spread via contact with mucous membranes. The theory of HSV reactivation has recently been expanded upon to include not only latency and reactivation from the dorsal root ganglia but from the epidermal cells themselves. These two different centers of reactivation lead to both immediate and delayed herpes lesions. This ‘skin trigger’ hypothesis helps explain why prophylactic oral antivirals such as acyclovir do not work on immediate HSV lesions. However, there remains a need for further investigation into topical agents for the prevention of immediate HSV lesions. No animals/humans were used for studies that are the basis of this study.